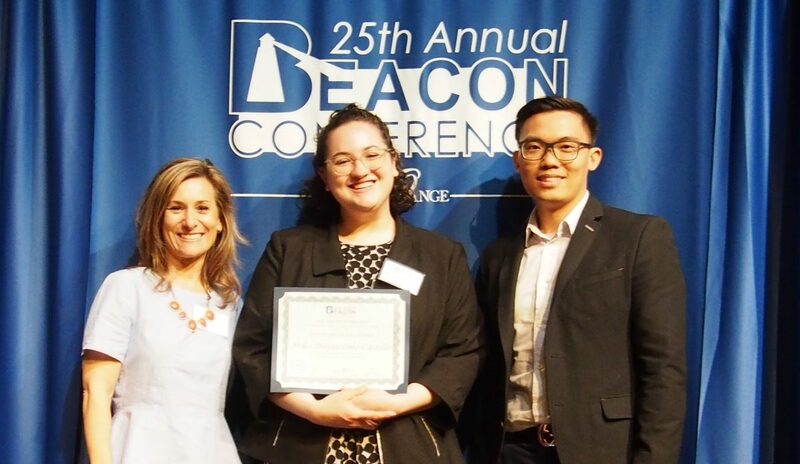 Miko displays her Certificate of Excellence at The Beacon Conference with her mentor, Professor Alexandra Della Fera and Honors Program coordinator Professor Marc Yeung. Miko DiGiacomo-Castillo, a PCCC Honors Program student, received a Certificate of Excellence for her June 2 presentation at The 25th Annual Beacon Conference held at Orange County College in Middletown, New York. This is the first time PCCC has participated the Conference, which was established to recognize outstanding students from two-year colleges in the Mid-Atlantic region. “It was very exciting that one of our students was selected to be a presenter,” said Professor Marc Yeung, faculty advisor to the Honors Program. Miko, a communication major at PCCC, was one of three students selected from a pool of applicants to present in the Communication category. Her presentation is titled “Reflections of Social Change on Comedic Television.” See it here. Recognizing that people “want to have these larger conversations about gender, race, sexuality” which “can be too daunting to unpack,” Miko decided to focus on these ideas through television comedy series. A Ringwood resident, Miko graduated in 2015 from Lakeland Regional High School where she was in the top 15 percent of her class, qualifying her to receive a NJ Stars Scholarship, which covers her tuition at PCCC. While at Lakeland, Miko, received the George Eastman Young Leaders Award, presented annually by the University of Rochester to high school juniors who demonstrate strong leadership experience in the school and community, high grades and challenging courses, and extensive involvement in extracurricular activities. At PCCC, Miko joined the Honors Program, an accelerated learning initiative that offers academically talented students a more rigorous course of study along with enrichment opportunities that include cultural arts experiences, challenges such as The Beacon Conference, and internships. Through the Honors Program, Miko also landed an internship last Fall at the office of New Jersey Congressman Bill Pascrell, Jr.